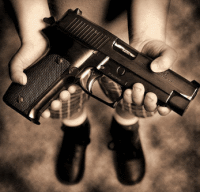 A 13 year old kid in Tacoma Washington has been busted at school with a handgun and a pile of ammo. Obviously with all the school shootings that make the news, this sort of thing is taken very seriously indeed. However after a brief investigation it was uncovered that he actually just brought the thing to school to swap it for a PSP. He apparently swiped it from his dad’s gun collection, now after checking the collection the dad has found that yet another gun is missing which has the school panicked and anti-gun lobbies gesticulating wildly. When the other gun went missing is unknown at the moment but maybe the dad should check to see if his little angel has found an iPod or new skateboard recently? Previous article Zombie Apocalypse – Good clean fun?